Today I will describe the steps needed to install CyanogenMod on a bootable SD card for use on the Nook Color. The point of making a bootable SD card is that it preserves the stock install of the Nook Color (and your warranty). In plain English this means you will still be able to continue to purchase & share books, magazines, and apps from B&N, then when you want to use the Nook Color as an Android tablet you may “pop-in” the SD Card that has a bootable CyanogenMod 7 image. This gives you the ability to purchase Android Market apps, use Gingerbread (Android 2.3), and lets you take advantage of the working bluetooth chip hidden from users and disabled on the hobbled flavour of Android installed by default on the Nook Color. I read many sources of information and grateful for the information learned from members of these incredible communities: CyanogenMod Wiki, XDAdevelopers, and NookDevs. The install method I formulated is an amalgamation from information found on the Nookdevs and XDAdevelopers pages and forums. Some prerequisites before you begin – first you will need a suitable micro SD card, I am using a PNY 8GB Class 4 micro SD card for my image, 2GB is too small and 4GB cards aren’t worth the bother. But according to this table you may wish to purchase a cheap Sandisk Class 2 8GB card for best performance. Another hardware requirement is a way to write data to the micro SD card if your computer does not have a slot, the solution is a USB to micro SD adapter. Although I used an adapter that came bundled with another card I had purchased in the past, this and this were found on Amazon within minutes, these adapters are available at virtually all shops that carry micro SD cards, or usually bundled with a card as mine was. Cost is usually very cheap, especially if purchased online. CyanogenMod v7.0.3 encore (stable) – found via this page. Version 1.3 of the “size agnostic” CM7 SD card installer – found via this page. Google Apps for CM7 found via this page. If using MS Windows you may need two more extra applications Mac users need not be concerned with. The first is WinImage, and the second is 7-zip. After the three files have been downloaded, place all of them in the same folder. If using Mac OS X, place the files in a new folder named cm7 in your home folder, and if using windows place the files in a folder with the path of C:\cm7. Windows users can extract using the 7-Zip application. The diskutil list command is used to find the disk number of the sd card, the number is used to instruct the disk dump (dd) command to write a bootable partition table. Based on the information listed, I determined that the /dev/disk3 entry on my machine matched everything I know about the sd card: the size (8GB), partition type (DOS fat 32 partition), and mount point, (I mounted this disk last). A good way to verify this is to run the diskutil list command immediately before and after inserting the sd card, comparing the tables to find the new entry that will be the number of the micro SD card. It is vital to know the correct disk number, because this information is used to write a new partition table on the card, effectively formatting it, so please double-check to ensure you use the right /dev/disk mount point number or the wrong disc will be formatted. Windows volk need to use the WinImage program to write the generic-sdcard-v1.3.img image file to the appropriate micro SD card drive mounted on their system. After the image has been written to your SD card, copy the update-cm-7.0.3-encore-signed.zip and gapps-gb-20110307-signed.zip to the micro sd card (NOTE: if you do not desire access to Google Market & Apps, neglect to copy the gapps-gb-20110307-signed.zip file). Do not unzip or extract them, simply copy the zip files to the root folder (no subfolder) of the micro SD card drive most likely named “boot”. Although the following screenshots are of a Finder window on a Mac, the same exact principle applies to windows users using Windows Explorer. Now you may eject the sdcard, ensuring that your Nook Color is powered completely off and insert the card in the corner slot of your Nook Color, turn on and begin to finalise installation of CyanogenMod 7. « How to add web links to the home screen on the iPad & iPhone. This was a fantastic step by step guide! My only questions are should I keep installing the nightly updates and how do you see all the apps that are running in cyanogenmod 7? If you tap the middle button on the small toolbar at right, that will display all of the apps you can run. To see all of the apps currently running, you use the “real” buttons: ∩ button and -. 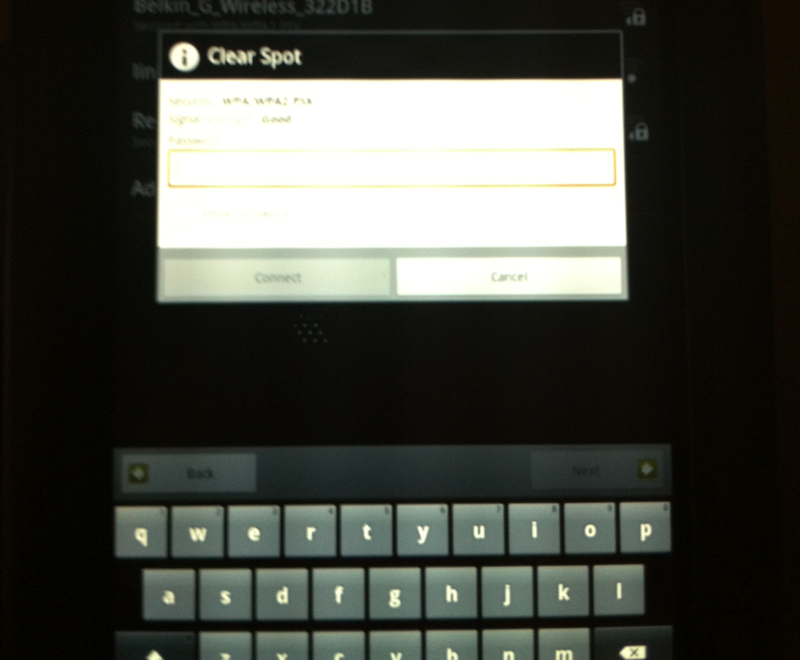 When you pop out the sim card, the ∩ button and + buttons are used to take screenshots on a “normal” Nook. Thanks for the great howto. This was definitely the easiest setup I’ve seen. I’m up and running 7.0.3 and it looks great! The only problem I’m having is that I don’t seem to be able to reboot into ClockworkMod Recovery mode. When I ask to update to a new ROM, it says it’s going to reboot into recovery mode to complete the update, but then it just boots back into CM7 normally without going into recovery mode. Any idea what I need to do at this point? So, I tried this, and I’ve actually looked at a couple of different tutorials; but with this one, the OS won’t even install. It simply says that there isn’t enough space in the boot partition. I am using a Scan Disc 4 GB class 4 Micro SD. I understand that it ought to work on a 4GB card and I want to see it work before I drop $30 on an 8 or 16 GB card I don’t need. There is another tutorial in which it will install and load to the boot menu. But then it just sits there (I’ve waited at least 12 min. before). Any thoughts? 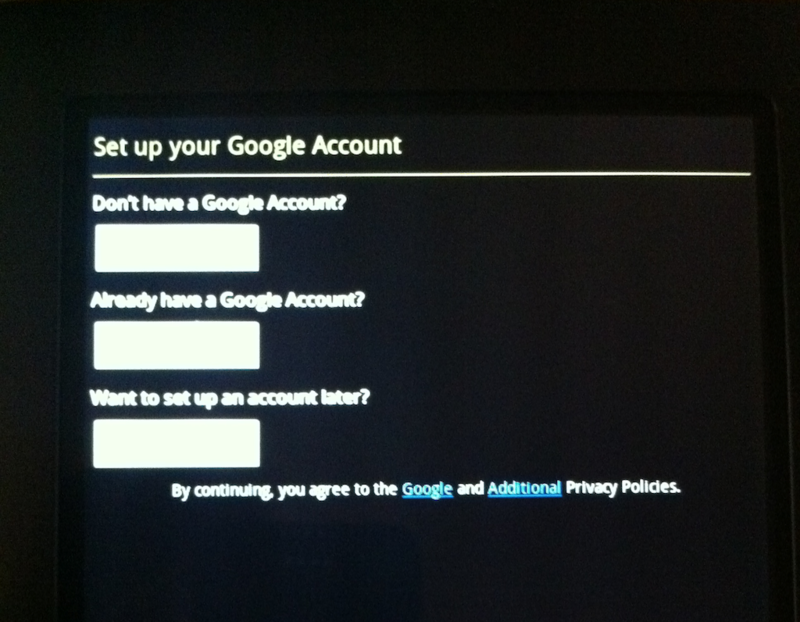 2) Try without the Google install to determine if it is a free space issue. 3) Lastly if above options do not work try another SD card, some cards are a bit wonky. It doesn’t look like the SD card has been formatted correctly. It appears to have an extra partitiion. Try removing the partition and reformatting again, then follow the steps, and it may work. Also keep in mind this tutorial applies to the original Nook Color. Thanks for the advice. Uh…which parameter needs changing, and how do I change it? By which parameter, I mean, where do I find it. Can I overclock the processor when running the CM7 via a bootable microsd card? If possible, it would make this tablet that much more formidable. It appears that the Dalingren kernel supports overclocking: It is supported in three main flavours: 1.1 GHz, 1.2 ghz, & normal 800mhz. Then there is a experimental low-voltage version of the 1.1 GHz kernel. Thanks for this, followed it step-by-step and booted my Nook Color with an SD card, leaving my Nook intact. Was really impressed with the speed of the card based OS. Thanks for this and thanks to all the folks who worked hard to make it available. I agree that we all should give the members of those communities a big hearty pat on the pack. Thanks for reading. I am having a terrible time despite following the simple instructions. What happens is that the initial boot from the sdcard fails in the install process. It goes into a screen with linux penguin on top, it adds a partition to the sdcard, it tells me about ~450 files it’s extracting from the zip. But when it tries to access the file ‘META-INF/com/google/android/updater-script’, which seems to do the next step of linking and permissions and setting up the boot to run CM7 etc, it declares that the file can’t be found. Then it helpfully deletes the zip file. So the next reboot from the sdcard, it tries to do the first step of grabbing the CM7 files from the zip file again, but the initial zip file is gone. The file exists in the zip archive. I’ve tried a bunch of stable and nightly builds. Same result no matter what. Good one – or should I say bad one, you have me stumped. Usually when odd things like this happen, I try from square one eliminating issues. Try either the whole process dd formatting, with recopy of image, etc. If that doesnt work, try a different card. What size are you using incidentally? One reader had probs with a 4 gig card. This sounds very much like a dead sector on the media. I’ve had similar issues with USB memory sticks that had been overused, and of course, on hard drives. Using mac osx, double click the image to mount it (we’ll pretent it’s at /dev/disk4, and the card is at /dev/disk3 still). If cmp finds differences, your card’s probably got bad memory. This process worked great for me. Initially I felt that the browser was working slow. Installed App killer to kill other apps that were running, then the browser worked great too. Thanks for the feedback & tip Sathish. Stephen, thanks for your prompt responses, i was fiddling around in the CM7 menues and came across the CPU processor settings. So could I bump this thing up to 900 mhz right within cyanogen, and if so does the voltage have to change? BTW, you and other readers that have commented in this post now have Google + invites. So check your inbox(es). Best tutorial that I have found for doing this. One thing that stumped me was how to use WinImage. Found the answer and I think it should be added for newbie’s like me. Thanks for a great write-up. * Select Disk from the menu and select “Restore Virtual Hard Disk Image…”. * Select your SDCard from the list and click OK.
* In the Open dialog box select “All Files” in the lower right file type box, browse to nookhoney.img, select, and click Open. o Last warning, click YES to write honeycomb to the SDCard! Thanks for the great feedback, real good Windows honeycomb install technique. The install appeared to work correctly and completed. The Nook powered down automatically. Then, when I pressed and held the power button the Nook would not power on (no sign of power on at all). When I remove the SD card the Nook will power on to the BN OS as expected. Thank you SO MUCH for these directions. This was by far the easiest and clearest way for me to root my NC using my micro SD card. No problems mate, thanks for reading. I get through to the point the NOOK shuts down. Then I see the CM7 logo. But it doesn’t go any further. Instead the CM7 logo comes on. The arrow spins. Then it repeats. Never giving me the gmail option. Any thought? It has hung at this point after 4 attempts. Thanks! It seems to be the SD Card. I tried a SanDisk 4GB – went through the same steps – using the same Nook. And voila. It booted with no problems on the first attempt. It seems some SD Cards are finicky. great and easy to follow tutorial! thank you very much! I’ve been back & forth with every flavor of rooting. Finally nice to see one that let’s me keep stock! Thanks for such clear directions !! Can you point me in the right direction to run netflix and hulu? Netflix is available on the Android Market here. Hulu was found (Hulu+) here. Did everything above ran sd card in nook, installed and shut down. When i turned it back on, it says loading and then goes to a black screen that says android in the bottom left with a flashing underscript after it. Tried turning off and on several times. Same thing. Help! What size/type of card are you using? That generally seems to be the unifying cause of most problems experienced. Try a 8GB card if you can, and then try another brand of card or class if problems persist. Worked perfectly! Thank you thank you! ShareTheWeb Hi I’m new to cyngenmod7 and I’m loving it, I will not go back to stock OS’s. I wanted to thank you for putting this together for the nook color. Everybody else makes this such a pain the neck. When it’s not if you have the proper guidance. Is there somewhere I can send a donation? I understand the hard work and dedication it takes to do these installs. People in general are clueless. Keep up the good work and live long and prosper. Thank you for the kind sentiments, if you want to help the tablet community with a donation, I would suggest donating on the XDA Developers site. Often times, money is needed for tablet tear-downs when a new device arrives on the scene, these tear-downs give the CyanogenMod and other dev groups info on chipsets, hardware capabilities, and other technical info required to take full advantage of hardware and/or helps to figure out an approach to get Android on a hobbled device. The Nook Color is a perfect example of this situation. Worked great !, thanks a lot for an excellent job. No problem, my mysterious friend. This worked for a month and then one day I tried to boot it and it kept getting hung up on the startup screen… any suggestions on how to fix this ? This has happened to me in the past, and the first time was my fault: I removed the SD card without a full power off. The second time I tried rebooting, etc — didn’t work. In desperation I tried the following and it happened to work — but keep in mind this is more voodoo in my opinion than anything. 2) Remove SD card image. 3) Power on – this will boot the “Stock” Nook. 4) After the Nook comes up, once again a full power off. 5) Reinsert bootable SD card and power on again. This happened to work – although I know of no logical reason *why* it did. Like I said – voodoo. Let me know if this works, in the meantime I will do a bit of investigation and see if someone else has experience/solution to this odd situation. I had a similar experience. everything worked great for a while and then it would work but crash after @ 10 minutes. I did the wipe and re install and it is fine now. I am running Nook 1.3 and upgraded to the dual boot process (now I can switch back and forth with out taking the SD card out! How did you do the dual boot process? Never done anything like this before and have been reading all kinds of info…tried once but failed now I am getting the courage to try again but would like the dual boot process as I do like my Nook set up too. She has all kind of tips, scroll down to 8.20.2011 on the home page for the Dual Boot stuff. Really easy! Thank you Lisette…getting up the courage! 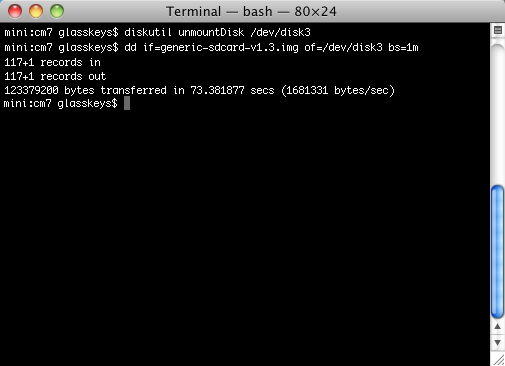 can you burn the SD card via Disk Utility? I am running Lion and when i tried to use the terminal window to extract the file it said ‘command not found’. I don’t know how to ‘find’ the file to give it the right path through the terminal window. Which command could it not find? I ran the following commands on my system. The lines below the $ commands were returned by the OS. Run both commands in terminal, if bash does not return a result under the command you type that means it could not be found and is missing. On the other hand if you do see results you may just need to ensure the folders are in your path (should be already). in your .bash_profile you would add a line like this. But only do this if you need to. In my opinion though, I think this is something the Lion install bolluxed up. Thank you so much! I got it to work first time by following your directions to a tee. I love it!! You are awesome for taking the time to post this and share your knowledge. I’m trying to get this to work and I thought I had but it told me there is an error with the pixel clock. (says I’m requesting 68000 but got 66461 instead) It also says lack of boot patricians. I’m using a 32gig transend 4 micro sd card, any suggestion? any ideas? I’ve tried with CM7 and with Nookhoney, no luck with either. I got it to flippin’ work!!!!!! (doing serious happy dance!) The CM7 file needs to be in the home folder as in the users/folder with the dang house in front! I have been beating my head against a wall for 2 days! Your instructions really are the clearest on the web! Congratulations on your new CM7 install! I’ve tried different versions of the installer and CM but I can’t seem to get it to work. I see the word “error” a lot when it’s installing and when I turn the NC on I either get stuck on the looping CM7 logo or I get a black screen with a green dash on the corner. Can you help, please? I sent you a message, it may have been filtered. What are the particulars on card size, OS used, etc? 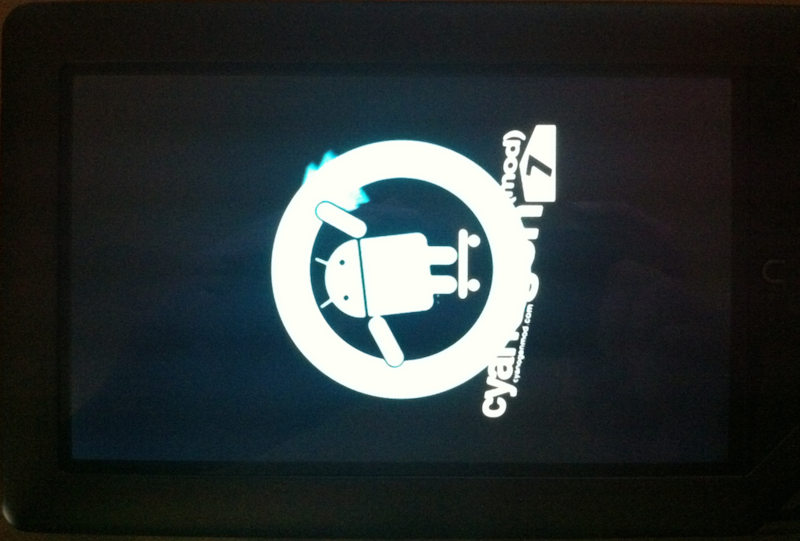 I am having the same problem with the looping CM7 logo after what looked like a successful install. Any ideas? I purchased a preloaded 8GB card, and it worked fine the first time before beginning the looping problem. I followed your directions and I am having the same problem now. Thanks so much for the detailed instructions! Worked very well. Brilliant! I am glad it was of help to you. Hi, I followed the instructions for windows and when I tried to copy over the image, my computer requested me to format my SD card. I did this and shortly after I copied over the image and the update-cm-7.0.3-encore-signed.zip. When I put the SD card into my Nook colour, I got the linux screen, but it shows a message at the bottom of the page; “Error! Unexpected lack of boot partition on the SD card”. The next line says “Please report” and the one after says “Power off when ready”. I’m using a Sandisk 16GB class 4 card. The line before this error message shows “Detected standard B&N nook layout, emmc first”. I’ve deleted the files and reformatted the SD card twice already but haven’t been able to get it to work. The error message remains the same and it won’t go beyond this point. I am having this same problem!!! ANY THOUGHTS?? Hello I have the same issue. Anyone know what the fix is? Do you have other links to the links that are not working right now …Version 1.3 of the “size agnostic” CM7 SD card installer – found via this page. Thank you for the update…I have place a copy of the “size agnostic installer” on a publicly available Wuala folder. You should now be able to download it from there. The link above has been changed to match this also. Well it booted, thanks to Stephen’s and John’s help. While it was booting, I finished the reading the comments, when i looked back, expecting the google signup, and it was booting the Nook software. Nothng seems to make it boot from the card, which Windoze recognizes as a boot disk with unzipped files. I used CM7.1, so I will try again with 7.03. I also noticed (in my wasted haste to get ahead) that there was a file overwrite of google apps and cm7 when I unzipped them on my laptop. I’ll post with further results. Thanks for your great step by step. I have repeated this a few times and it’s just not working for me :(. I’m using a PNY 16GB Class 4 micro SD card to try this out. I also tried it out on a SanDisk SD that I had laying around (because it was in my phone), but I think the issue was its size (the SanDisk is only 1GB). Could it be because I’m on Lion? Slightly different things happen in my Terminal Window to what it says in the instructions. I don’t know. That’s about the only thing I can think of at this point. I originally found this tutorial after finding one on a forum that uses Windows for the process. In that forum, they suggested that folks use a MD5 calculator to make sure that the files were not corrupted after download. I did that. 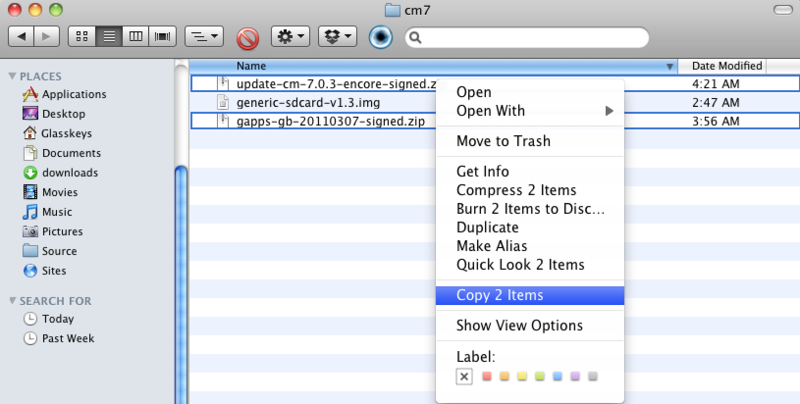 I’ve tried using update-cm-7.0.3-encore-signed.zip and gapps-gb-20110307-signed.zip like you did. I’ve also tried using the newer file types (the 7.1.0 and the 20110828) and neither combination have worked :(. I can’t think of what else to try now. Any thoughts? I FINALLY got it to work. Basically, I needed to get a new card – I read places that 16GB cards can cause problems with this process, so I got an 8GB card and tried it on that instead and it worked just fine :). I just wanted to come in and update instead anyone is having the same problem I was having. Follow the same exact step, just use an 8GB card instead of a 16GB. It worked without any problems at all. do you have windows 7? I do and so I am not understanding since the screen shots were on a mac. I DO have Windows 7… but on my Bootcamp (which is what I would have tried if this last attempt did not work). But you’re wondering if I did this in Windows and no, I didn’t. And since you’re on Windows and looking for detailed instructions for Windows users, I hope Stephen doesn’t mind if I post a link to another blog on his site. If so, please omit that part – no harm was intended :). Here is a step-by-step tutorial for Windows users. I hope that helps. The second one has videos even :). Thanks for the great feedback Sophia! UGH. I cant do it. I have a headache from trying. I wish I would have just bought the N2A card like I have read to. I tried doing what you said above. But I have no clue what is wrong. I dont see how to copy to the boot file of the SD card besdies just copy and paste method or drag and drop. Then I dont extract the 2 other files ever? I have all these files on my SD card but yet my nook color powers on to regular os as usual without any change. I just copy this over I used win image and sent over but that didnt help me. I think Im totally clueless here. I fear that a 4GB disk might be too small for this. Try a 8GB instead, if you can get your hands on one. And again, be weary of a 16GB because those can have issues. is what you’re burning the file onto the disk with. So, basically make sure that 1) you extract the file first and 2) you make sure that the correct disk number is being used (i.e. – when you replace the “3” symbols in the above code). Type carefully…. or just copy and paste the above code (which is what I did). Also, make absolutely sure that the nook is off before trying to install all of these files. Do that by turning it on, then holding the power button and waiting for it to ask you if you are sure that you want to power it off. I hope that helps :). Look for johns to comment to understand how to use winimage to install the size agnostic boot package, I still haven’t tried cm7.1 without google apps or cm7.03 with google apps to see if it’s the overwrite issue or a me issue or a hardware issue. My understanding is that 4gb is enough to test it out but it won’t leave much room for anything else, but I haven’t gotten all the way through setup yet, so it’s worth what you paid for the info….. I would imagine that 4GB would not be enough not merely because it does not give you a lot of room for anything else but more (or “also”) because those zip files get decompressed during this process and everything would simply run more smoothly on a little more space is all. As for the imaging, I understand it to be basically the difference between copying the file ONTO the SD Card and creating a card that IS the files (if that makes any sense). Anyone get this working with CM7.1 ? Hi Steve, I was wondering whether the same process can be used to boot cyanogenmod 7.1 to the microsd card. Do you have to get a different size agnostic installer? For those reading this – the 7.1.0 CyanogenMod Syed is referring to is available direct from the CyanogenMod folks on this page. Stephen, if you find a similar process for 7.1 then life will be grand! Please share as soon as you figure this out. i need some help. After inserting the micro SD card into my nook, it flushed the caches and all that. The only problem is, it stopped saying “not enough storage”… what should i do? i know it is almost 7 years too late, but thank you @Sophia and @pathfndr for the advice. Thanks for a great post. Process worked fine. I was tempted to try 7.1, but I just installed 7.0.3. to start until I see how your weekend goes. I am finding a number of apps in the Market say “Your device is not compatible with this item”. Do you have any types to avoid this issue? There are several apps I want to use that I can’t download via market. I worked around one by using a beta and side loading, but I’d really like to figure out how to use the Market directly with this install. Maybe 7.1 will have less compatibility issues? Brian, I had the same issue, and I just downloaded the .apk files for the incompatible apps (google maps, adobe flash 11 etc.) and side-loaded them onto the nook color. It did work for me, but it appears to not hold, as after a while I started getting the message again. I’m not sure if the setting doesn’t hold after reboot, so you have to repeat or if it just isn’t the ultimate solution. I can’t always seem to find the apk files for all the apps I want, so hopefully the Market issue goes away soon. Okay, I have a question.. I got CM7 installed and loaded.. it goes to the CM7 home screen, underneath it says “Loading”, then it just goes to a black backlit screen. That’s it. I’ve tried rebooting.. not working… any ideas? Also, my microSD is an 8GB Sandisk and, for some reason, when I write the image to the SD card, it creates two partitions on my SD card. One is about 130 MB (where everything is being saved), and the other is unallocated and inaccessible at about 7.2ish GB. After I write the image, I use EASEUS Partition Master to basically merge the two partitions and then copy the Android OS over.. I’ve been using the size agnostic SD image because I can’t find one that’s specific for an 8GB. That’s what was happening to me when I tried to load everything onto a 1GB Micro SD card. I think that may be a space issue. It MIGHT be having a problem with trying to decompress the other files (Or, at least, that’s the impression I got with it) and that then makes the process hangs near the end of the install. Thanks for doing such a great step by step for ignorant folks like me! I am having trouble – when I try to unzip the installer, it tells me there is no such file or directory. Furthermore, the file itself does not appear to be zipped anyway. At some point I got it to write to the disk anyway, and then when I inserted it in my Nook, it tried but said the initial install files could not be found. It told me to get them at nook.linuxhackers.ru, which Safari could not find. I was previously getting that linuxhackers.ru message too at one point. I have no idea why that kept coming up. In the end, what I did was reformatted the card and kept trying again and it went away so that’s part of how I knew that actually, I was doing the steps correctly overall. Finally, I tried a new card and things worked out for me. Is that card an 8GB, by the way? Also, so you know, it is possible (and probably easiest) to use the Nook itself to reformat the card if you want to start over from scratch. Now about the unzipping. I forget which browser (I think it’s Safari), but when you initially download the files, the browser AUTOMATICALLY unzips it – a feature that I guess is SUPPOSED to be for convenience. I am assuming you are on a Mac because that was happening to me on a Mac and it doesn’t seem like a Windows habit. So, what I would suggest is using a different browser for the download. If Safari IS the browser that’s doing it, then I can safely say that FireFox is safe (and vice versa). I use three browsers on Mac – and Chrome is one that I am absolutely sure keeps things in tact (figured I’d mention that too). Thank you Sophia! I used Chrome to download them and that worked wonderfully! Everything went great until I tried to turn the Nook back on – it won’t turn back on! I take the SD card out and it works fine with the stock OS. I tired 2 different cards, one a 4G and one 8G and both did the same thing. And yes, I am using a Mac. Any ideas? Thanks for your help! I’m glad the Chrome suggestion helped. What I now suggest is this – reformat the 8GB and try again following the steps above. The fact that you got past (what I’ll call) the “Penguin scroll” part of the process shows that you properly completed all of the steps needed and that there’s just one little glitch here or there to work through… and that you’re ALMOST there :). Make sure your Micro SD card is plugged into your Mac. 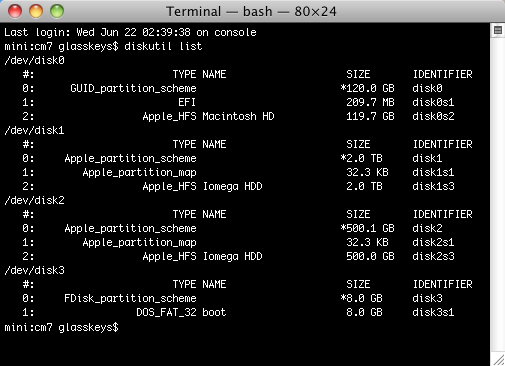 Next, hit Command + Space and type to search for the “Disk Utility” application. When that comes up, the Micro SD drive will show up on the left side of the screen – select it (the top-most/main option). On the right side of the screen, you’ll see First Aid | Erase | Partition |… Choose “Erase”. For the “Volume Format” option, choose “MS-DOS (FAT)”. As for the name, that won’t matter because the process will change its name anyway (after the “Penguin scroll” part). Then click “Erase” at the bottom. I am having this same issue using a mac on and ADATA 8GB Class 10. Have formatted and re-installed a few times. Which issue are you having? The one where you can’t unzip the installer file or the one where you are getting the message with the nook.linuxhackers.ru URL in it? Hi, thanks for the detailed instructions. I ended up following Myra’s one but I also crossed reference to your post as it had a lot of other details on it. I also read most of the post and the issues others were having, It took me 3 attempts and 2 laptops before I finally got mine to work. I used 8gb Sandisk card as I read that other sizes and brands could have issues. When I got it to work (finaly) I tried dowloading some of the apps that I have on my smartphone, but I did get a message on Angybird Season’s that my tablet is not compatible, which really dissappointed me as well as the Rockplayer. I hope a solution can be found. Thanks again for all the help! Okay, I got it working and everything looks great, thanks for the tutorial! But does this process allow me to dual boot to the nook os? And related to jb’s? question above how could I upgrade to 7.1? Be sure do do a full Power Off (hold down Power Key, then power off in menu), then you may take out the SDCard and thereby booting into “stock Nook”. Right, I did that and it worked. Is there a way that I don’t have to remove the SDCard? I am far from an expert in all of this because I’ve just been playing around with it only over the past few weeks total. With that noted though, it seems to me that… in theory, yes, because they’re both grounded in Android. But, the way I understand things, the only way to be able to get close to being able to do something like that would be to somehow lay the Nook’s custom OS’s files over Android somehow. That’s (again) PROBABLY possible, but probably too tedious of a task to be worth it in the end. I mean, when the alternative is merely taking the MicroSD card out, I’m sure that is not an area of an already small area that folks are working on tinkering around with to find solutions to problems like that one. Just my two cents :). I’ve got to the part after it flushed the cache and powers down but when I turn it back on it starts the shutdown process again. Does anyone know why it’s doing this? Thanks and excellent tutorial. I’d also add that the nookcolor has an SDHC controller and will display attached SD cards as separate disk drives in USB mode connected to a computer (at least under windows). So as long as you have the USB data transfer cable, you don’t need any additional hardware to write to the SDHC card. when I use Winimage to burn generic-sdcard.img on my Transcend microsdhd 8GB I get : “the current image format is not supported by the disk drive F , it will be resized” I click ok and it is writing the files on my microsd and their size is the same as the original files, I copy cm7 and google app zip file to the sd but inserting the microsd to the NOOK does not work , it boots to NOOK . I’m not sure what the issue could be but have you tried Ana Mardoll’s instructions? They’re specifically for Windows is why I ask, and that might be helpful because it seems that there’s something going wrong along the way that’s prompting the software to ask you to resize everything. Or perhaps that’s normal but we’re meant to decline the offer? I’m a Mac user, but I wanted to give my two cents and post the links again to the Windows instructions. I hope that helps :). After following the steps up to when the device turns off automatically, my Nook won’t turn on again. Does anyone know how to solve this? I tried restoring my nook to fctory settings, but still not working. What sizedcard are you using Felipe? And by ” I tried restoring my nook to fctory settings”, did you mean that you removed the micro SD card? Taking the card out and restarting with it removed SHOULD solve that problem and allow you to start again from the beginning. I tried a 16GB card. I had my Nook rooted, so I restored it to factory settings after the issue. I did remove the card to do so, since it was the only way it would turn back on. I tried again and still got the same result. Thanks for the great info, and your patience helping people out. I’m following your procedure with 7.1.0-Encore and it seems to complete the process correctly – I get the pause at ‘flushing cashes’ and then the device powers down. But when I power back up, it just boots into the stock Nook firmware (the first thing I see is ‘Read Forever’, just like I didn’t have an SD card in there). I’ve tried this three times now with two different cards (an 8GB and 16GB). I’ve tried writing the image using both WinImage and win32diskimager. My nook is a refurb with 1.2.0 firmware. A similar thing was happening to me. What finally worked for me was when I followed everything exactly (i.e. – using 7.0.3 instead of the newest version) and that solved it. I had figured “Hey, if it worked back when Stephen first did it, then why not?”. Also, I’m on 1.3, so it SHOULD work on 1.2. Try using the 8GB and 7.0.3 and see if that helps. I figured it out. It looks like CM7 + the apps file has gotten too big for the partition that gets created when the generic-sdcard-v1.3 image is written to the card (~115MB). After writing that image, I used the free EaseUS partition manager (http://www.partition-tool.com/download.htm) to resize the partition… I made it 200MB (since this is a 16GB card and it doesn’t matter), but I doubt you’d have to go that large. Anyway, after this step, I copied over the two .zip files, put the card in my Nook, and everything worked. Now that I think about it, once time during the original install (before I resized the partition), I think a message about running out of disk space was printed out, but it flashed by pretty quick. It probably ran out every time I tried this but I just missed it. PS: This link provides some info on what do to after first-time start-up: http://www.androidtablets.net/forum/nook-color-technical/13156-how-cm7-bootable-sd.html. This is real good info. Thanks for the feedback Jay. I am also thinking that the technique you implemented could be saved to match the two sizes of cards, 8GB & 16GB image files for use with versions newer than 7.0.3. I could place them up on Wuala like the other file. Huh the Cynagen download page seems to be down, just when it was too cold to do anything outside. Has anyone got a mirror site for 7.03? Hopefully it will be up soon. Thanks for the info mate. I am going to place that file in a Wuala link as well so we don’t use up CyanogenMod.com bandwidth. I have now changed the link above and placed the file on Wuala, its also a bit faster. Having the same problem as George.. after everything seems to install it then shuts down corectly i think.then every time i power back up it goes through a couple of seconds of finishing up saying card is formatted for boot up,but after it powers down i get the same finishing up, card is ready powering down. Change the screen density from 161 to 160 and it will work. I had the same problems with Facebook and other apps. There is an app that comes with the conversion. Launch it and change the density to 160 then download the apps. Facebook still crashes, but that is the only one. 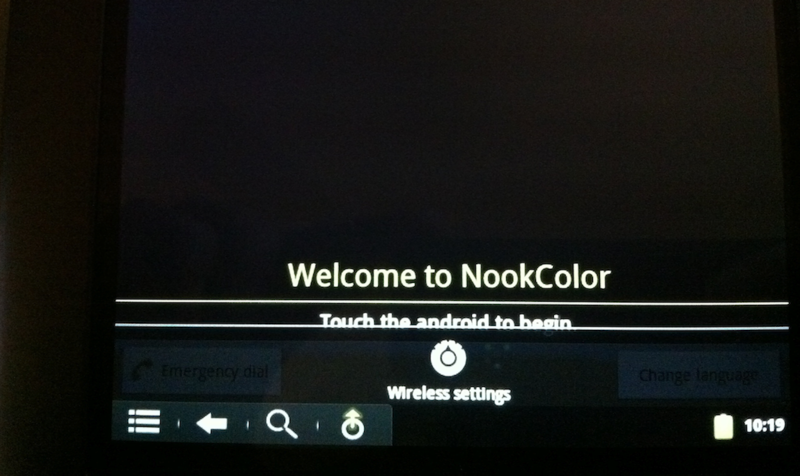 My Nook Color is now a tablet!! Thank you. I followed your directions and the only thing I had to change was the screen density from 161 to 160 for some of the apps to work. This was awesome!! Thanks for the great how-to. Everything is working great for me, but I would like to add movie and music files to the SD card which is showing plenty of space. When I try to add files I get a message saying there is not enough room on “BOOT”. Should I have partitioned the SD card before install? The only problem I am having is that some important apps won’t download because the market says they are incompatible with my device – Pandora radio and Facebook for example. How can I fix this? Did everything exactly as described, inserted my microSD card. turned on my NC. It just booted into normal NC. Did I do something wrong? What obvious step did I miss? Using 7.1.0 with gapps-db-20110828-signed.zip seems to cause boot from normal NC. It boots from Android if gapps is not copied to the microSD card. Still working on a solution for gapps. I’m using update-cm-7.0.3-encore-signed.zip and the other files in the root directory are MLO, u-boot.bin, uImage, and uRamdisk. I’ve tried booting it with both gapps-db-20110828-signed.zip present and not present. This makes me ponder if winimage is not writing the .img file correctly. You might try re-formatting the sdcard before using WinImage to write the .img file. In my case, I previously had another version of Android (Honeycomb, which seemed slow to me) on the sdcard and needed to do the re-format. But I tried with/without the gapps file several times and results were consistent (with gapps, NC booted from sdcard the first time, but not the second; without gapps, NC booted from sdcard first and second time and ran fine sans gapps). I just got my nook color, and root this onto a 16G micro sd card, then turned on the nook. It completed all the steps and powered down. After that, I was unable to power the nook up again. Took out the sd card and had to push the power button a while for the original nook to turn on. Check the sd card, all the files are there. ; Can anybody help and tell me what is the problem? Same problem here with 16gb sd card. Perhaps we need smaller sd cards? Same problem here: I followed the steps about 5 times, but each time, after the install sequence finishes and the NC powers down, it won’t power up again. At least, it won’t do so with the SD card installed. But (same as John, above) if you take out the SD, and push the power button for a while, the NC OS comes back on. 16gb card. I updated to NC OS 1.3.0. I used a Mac, and the 7.1.0 Encore ZIP. Stephen, even though I can’t get it going, thanks (!) for all you have done here. Hey, all, I think I figured this out. I think you need to install the OS (I used the most recent nightly build, #253) .zip file by itself – don’t do the OS and the GAPPs .zip at the same time. CM 7 is working … I’ll try and install the apps now. I also used an 8GB card (instead of the original 16), but don’t know if I need it. Thanks! I would like to now copy my working micro sd to a larger capacity card. Is there a particular copy program or technique I can use? Thanks! I have the same issue as Eldon (see above post). I have an 8GB card working well but want to go to a 16 or 32 GB card. Copy help would be much appreciated. I finally copied my card by using Winimage and, first copy a virtual hard disk image, and then restore the virtual hard disk image. It gives you the option of restoring to a fixed size or a variable size and I chose variable size presuming that it would allow use a a larger card. Anyway, it works! It does take a while as the image is as big as your original card is. Excellent tutorial! I just created 2 cards for Nooks for my kids for Christmas. I elected to install Cyanogenmod 7 version 7.1. Thanks to Jay K for the heads up about increasing the partition size. It worked flawlessly! I hope I’m not asking a question that I’m missing in the comments. I’m trying this process on a win7 netbook. the Winimage process appears to work, but it formats my 8 gig sd card as 128 meg, and, of course, fails during the install on the Nook. Should I be formatting the SD card before restoring the img file. I solved my problem. The default 128 meg boot partion that Winimage creates is too small for the boot partition with both Android and Google apps. I made it larger (and had an additional failure when I made it too large, and didn’t leave enough space on the card for the Android install) using the EaseUS partition manager (http://www.partition-tool.com/download.htm) mentioned in a comment above. I am having some difficulty that’s been described previously, that the NookColor won’t power up after the installation of the SD card. I’ve tried two cards (SanDisk). 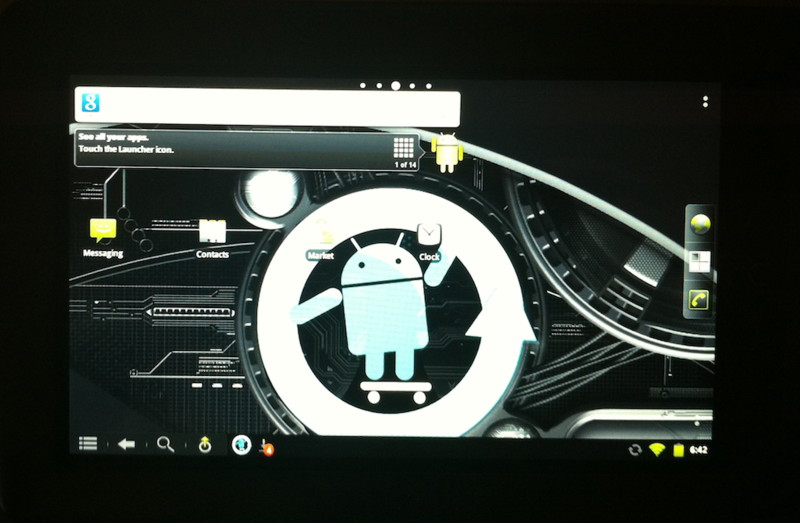 My NookColor was updated with the latest BN update to (their) Android 1.3, and I’m working from a Mac. The instructions were very easy to follow, and everything worked, up to the point where I should have been able to power on the Nook after the initial installation. I’ve tried with both cards at least twice, and two versions of CynogenMod (7.0.3 and the latest 7.1). Anyone have a similar experience, and suggestions? Sorry, then you need to reboot in restore mode, which you can do a couple of ways. Easiest way may be to long press the power button, and find the restore option from the reboot choices. When it rebootsit will install the gapps zip. Then download the nook tweaks app from the app store, to overclock the CPU. Good luck! sorry again … you need to reboot in recovery mode,not restore….. Mine says Permission denied when I try the dd code… What should I do? Are you using as su? Thanks for all the steps. However, I am having a problem for which I do not find a solution in the postings. I got a 16GB micro-sd card class 10. and went through the steps of getting CM7 installed. It is all successful. It even getsto the point where it turns the nook off. at the end of the install. However, When I power up after the cm7 install, all I get to is the initial splash screen of CM7 and thats it. It does not go beyond that splash screen. there is the animation where the arrow turns around and around and stops. Once it stops, the splash screen starts the animation again. I do not have the google apps package copied/installed. as some of the postings have indicated it might bea source of some startup problems. I have also tied using easeus to resize the partition assuming it was a partition size problem. But no luck. So I would appreciate if anyone has any pointers as to what the problem might be. Oh!. During the install service I do get some errors that might indicate a bad sd card. But to the contrary, all tests I run on a mac and a PC indicates the sd card to be just fine. If anyone is interested, I think my problems were due to a bad micro SD card. Here is what I did… I fiund a 2GB PNY class 2 microsd card and followed the steps to get CM7 setup on the card. Inserted it into Nook color and viola it booted up without any errors. During the initial bootup/CM7 install process, I did not notice any disk errors either. which prompt me to think that maybe the bad sector messages were causing the continuous loop of the initial CM7 splash screen. Its confirmed. It was a bad micro-sd card that for most general use, worked, but did show faults during the install process. I exchanged the card for a PNY class 10 16GB card and it worked like a charm the first time out. Hello, I followed the guide here pretty much perfectly I think with a 32 GB sdcard. I got all the way through the installation to were it flushes the cache for awhile, then powers off. When I turn my nook back on it then loads straight into B&N’s software seemingly ignoring whats on the sdcard. What the heck is going on? Windows? How big is the boot partition? Did you see any out of space messages before the flushing cache message? I was having the same problem with CyanogenMod v7.1.0. Once I tried v7.0.3 everything went as expected. so i did all the4 steps and made the disc, when i get my NC tomorrow i just pop that SD in there and boom that bad boy works. when i turn it off and pull the disc out its back to the normal NC right?? Any idea why I can’t get the Nook app on here? I havent found it on the tablet, and the market says it is incompatible. Best tutorial out there. Make sure you have the RIGHT sd card with at least 8gb free space. Otherwise it will not work. Trust me, I went through 4 of them. I had success with the two cards I tried, a Lexar 16GB Class 6 and a SanDisk 8GB Class 4, but I had to use CM version 7.0.3 instead of the latest 7.1.0. Installing CM 7.1.0 went as expected, but the nook would not reboot at all when the 16GB card was in, and with the 8GB card it would always reboot into B&N’s software. when i first put it in my nook opened that page you were talking about with the penguin. when i rebooted my nook it rebooted into the nook software. please help me here ive been working at this for a month. thanks nolton. Two factors most readers have encountered: Using this technique, ensure you use the 7.0.3 version & secondly the card chosen cannot have any r/w errors. glasskeys.com — The resource for touchscreen computing fanatics. I have tried two different SD cards, both with the same result. I boot from SD and get the installation process as described in the write up, but after it powers off I restart it and it boots to Nook OS rather than from the SD. I used Winimage to recover image to the SD card, then drag and drop the other zip files to the SD card. Is there something I am missing? Any fixes would be great. I had the same issue, how do you remove the boot partition from the sd (that isn’t in your nook) when you were done? I solved my own issue by umounting the partition and then deleting it using the disk utility in linux. i have tried to bulid cm7 on sd card and everything goes great it runs caches and reboots to cm7 and comes to the screen to set up but touch screen does work any suggestion? I am having the same problem, I have tried both a scandisk 4g class 4 and an scandisk 8g class 4. Has anyone come across the same problem and fixed it? This is fantastic! Thanks for all your help and time writing this! I’m trying to do this over Ubuntu. However, once I do the “dd” command, the file transfers correctly, but the disk is then rendered unusable by everything I stick it into? Where’s my problem? I am having the exact same problem while trying this with Ubuntu. I had an issue because I used a regular sized SD adapter in my laptops SD card slot, and the Nook wouldn’t boot off of the micro SD card. So then I purchased a micro SD USB adapter, and everything worked brilliantly. I have an issue with generic-sdcard, when I download the link you have provided onto my laptop the file name has changed to generic-sd.img automatically. Is this something I should be concerned with? When I have followed the terminal instruction, using generic-sd.img instead, it changed back to generic-sdcard.img.gz and wrecked my SD card in the process. Now my Mac doesn’t see the SD card anymore. What do I do? Thanks for your help and for your time. TC! Oh my gosh. My boyfriend figured it out for me!!! He said that the unmount disk is the issue. So we reverse engineered it and finally got it to work. So my sd card was not destroyed after all. First, most Safari internet unzip your files for you automatically. To stop that, go to Safari, Preference, UNCHECK open “safe” files after downloading. You need to keep your downloaded files in .zip format. Secondly follow the directions carefully to the letter. I am so frustrated!!!!! First I followed another website’s instructions and didn’t realize I had to unzip the first image file. After about an hour and reading tons of comments I figured that out. Then I follow the rest of the steps with my 16GB card. I get an error that says there is no partition. After doing a google search I found this site, and see it looks like it doesn’t like the 16GM card, so I switched to my husbands 8GM Class 2 SanDisk Micro SD. I formatted the card, and followed the directions again. Now it will not go into Boot mode, it just loads the Nook as usual, HELP! I have installed this on my Nook Color. I have been using CM 7.0.3. I get the Penguin scrolling screen and it turns off. 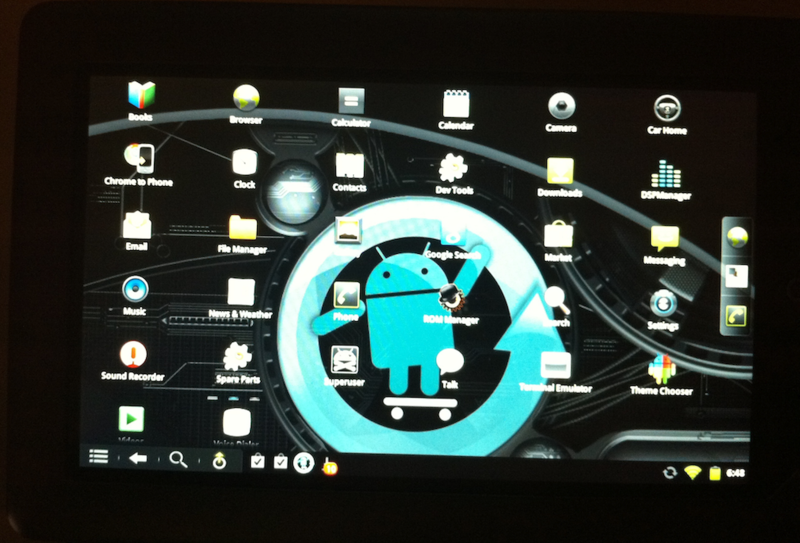 Then when I turn it back on again it comes to a set up screen and it seems that the touch screen doesn’t work at ALL. No buttons work and all I can do is just turn it off. Any suggestions? I’m doing what you are doing and getting the same result… NO TOUCH SCREEN CONTROL at all. All I can do is power down. I did remove the gapps from the boot disk and just used the boot image and the CM7.0.3 file and got one step further into Andoid by reaching what appears to be a “desktop” screen with several folders for viweing available apps and changing the clock, but still no touch screen at all. Can ANYONE out there offer a solution??? Joe… Did you ever solve your problem with no touch screen control? When i get to the terminal part, after i type in the first command, it says that ”there is no file in directory”. What should i do? make sure that the cm7 folder is in your HOME directory – the one that has the little house next to it. You also need to make sure that the .gz file isn’t already unzipped. It seems that you need to unzip it through terminal for the file to be recognized later on. I tried with several other SD cards to have the same error appear. Does anyone have any suggestions? I also saw this a few times as I stumbled through the process. Be sure that you close down anything else that could possibly be accessing the file, including any Windows Explorer windows that are looking at the image. WinImage seems to be very protective and won’t let anything else be looking at the image file when it writes it to the disk. Thanks for the tutorial – I had good success with a 16Gb Class 4 card. A couple of things that helped along the way were the detailed instructions for using WinImage and the comments from Jay K. I ran into the exact same problem where it ran out of space trying to install both CM7 and the Google Apps. Instead of changing the partition sizes, I got it to work by only just installing CM on the first pass and then installing GAPPS by rebooting into recovery mode. I have a 16GB Class 10 SamSung card. I get an error in the Linux listing while it’s inflating the “update-cm-7.1.0-encore-signed.zip” file that there’s a write error due to there not being enough disk space. I have noticed that a Class 4 card works better than a Class 10 card. In the past I used a SanDisk Class 10 card and I would get force closures all the time. I switched a SanDisk class 4 card and not a single force closure since then. I can believe it. Counterintuitively it appears that higher class rated sd cards can be worse. The theory is the rating is higher for cards that write *large* amounts of data quickly. Linux/Unix based systems have a need for cards that write smaller blocks of data quickly, which the higher rated cards are not necessarily quite as adept at doing as a lower rated card is. It is best to update your Nook color to the 1.4.1 stock update and register your device prior to doing any modifications to the device. 1. Download generic-sdcard-v1.3 img and unzip the file. 2. Download update-cm-7.1.0-encore-signed zip file (CM7 stable). 3. Download gapps-gb-20110828-signed zip file(latest google apps). 4. Use SD Card Drive Format Tool to wipe drive and get a clean start. 6. Burn the unzipped generic-sdcard image to sd card using Win 32Disk Imager. 7.a. Use SD partition manager to partition Micro SD Card from 107MB to 150MB you have to hit apply once you make the change for it to take effect. 9. Power down Nook and insert SD Card. 10. Power on Nook and wait for CM7 boot program to run. You will see Linux Penguin and a bunch of scripts run and packages install. 11. Program will say install finished “It is safe to power off now” but wait until the screen goes blank. 12. Hold power button for 10 seconds to power down Nook. 14. You will see blue text Android followed by CM7boot screen followed by a choice of com.android.provision.DefaultActivity or Setup Wizard. 16. Touch the Android to begin. 17. Choose skip at google account. 18. Choose next use location. 19. Select time zone, check automatic then next. 20. Press the n button. 21. Then Menu>Settings>Wireless & networks>Wi-Fi settings and connect to your network. 22. Once connected use the Back button twice. 23. Choose Accounts & sync from the menu. Add account>Google. 25. Sign in with your Google account. 27. Select the Google apps to install (recommend Gmail, Google Maps, Google Voice and YouTube). Click OK.
29. Click each selected app to download it. 30. Choose if you want to use backup & restore, click next. Menu>Settings>CyogenMod settings>Performance>CPUsettings>Max CPU frequency: 925MHz, Set on boot checked. Menu>Settings>CyogenMod settings>Tablet tweaks>Choosesoft-buttons: add Home, set others to preference. Many thanks to J515OP, glasskeys, and everyone else for getting the first versions of this how to posted! Hi guys, I’m following this very simple and well written guide but it seems I’m failing at some point. I’ve successfully written the image on the microsd card, place both CM 7.1 (latest stable version) and gapps (also latest possible version) and after I power up the Nook with the card inside it the process begins, everything seems to goo just fine, at the end the device powers down. The problem is that when I power it on after that it boot the stock OS instead of CM. Not only that but it shows me that there is a memory card inserted and gives me the opportunity to explore it’s contents. I see all the files that have gotten out from those zips and stuff… What do I do wrong? The card is an 8GB Transcend class 6 if that’s a factor. Update: I got it! It seems CM should be installed on it’s own and booted at least once and then the gapps zip should be put on the card and the device should be rebooted in recovery mode. Gapps install successfully and everything is just fine. I have a NC 1.41. I followed the (very good) instructions you have above and this is what happens: The penguin page shows up on power-up and it looks like CM (7.03) installs and then powers down. When I restart, the same thing happens, only faster. I am using an 8GB class 4 card. I also tried a 2GB class 4 card with the same result. I did this with 7.03. I also tried 7.1 on the 8GB card but it looked like some of the messages on the scroll said not enough memory. Follow-up: I Re-formatted the card and put only CM on it, following Martin’s post above. Cyanogen boots up just fine. After I play with CM for a while I will add the gapps zip file to the card and see if it works. This is a great and easy to follow guide. Thanks glasskeys! This is the best step by step instructions I have seen on this topic. Does anyone know if this will work for the Nook Simple Touch? It probably won’t due to speed, and especially video as is my guess it uses a radically different chipset to handle the eInk based display. Thanx man for such a comprehensive setup sharing…….well m trying to do this on my nook color…from last so many day i ve watch all the video ony outube for this…but none of them work for me…..forsome reason my winimGe software is not able to write the imag file to sdcard though its 4GB card but…….i coldnt find the reason….but i do appriciate the effort of all you people out tnere…..keep sharing good things…..
Will this install the CyanogenMod on the nook or just the SD card i want to dual boot CyanogenMod with the nook os but i dont want CyanogenMod installed on the nook just the sd card. i have installed the img on the sd card and moved over CyanogenMod to the sd card but it still will not boot into CyanogenMod. I have tried it on both a 16g and 8G card. the nook boots but no CyanogenMod. I read on another site that newer Nooks (purchased after 12/1/11) have an updated screen and require a different driver than is included with these instructions… Thats why everything works fine except the screen is unresponsive. If someone has updated this C mod 7 to include the latest driver I sure would like to know how to solve this because I’ve been sitting on 2 of them for 2 months now. You may have to manually change the pixel density. How onewould do that i do not know :( lok up changing pixel density for nook and cm7 iguess. In the market there’s an app called Blade Buddy. I used to change the density, it works just fine. I found that the most recent version of Cmod 7.1 must include the latest touch screen drivers because now the whole process works, HOWEVER,,, do NOT include Google Apps in the original boot procedure. It messes with the reboot and you end up back in B&N’s OS. Load the unzipped SD card image and the still zipped Cmod 7.1 as per the instructions, then after wards, take the mini SD card back to your computer and copy the google apps onto the card. After reinserting the card and booting from it, hold the power button in until the list of options comes up including “Reboot”. Choose “Reboot” and then “Recovery” mode. This will load the google apps and you are all set. ive tried this but once the nook builds the first time /i can no longer access my /sd card unless it is in my nook i put it in the root of the sd card but it will not isntall google play at all says not found on the recovery boot help!!! I have a question. So far I’ve been rocking the CM7.1 on a Transcend class 6 8GB microsd card and I’m pretty pleased with how the device is responding, but after reading almost everywhere that if wanted enhanced performance SanDisk class 4 is the right sd card I just couldn’t keep myself from buying one. The thing is that I already have set up the android in the exact state I want it to be in (apps, settings, etc.). My question what is the best way to clone the contents from my current bootable microsd card to my new SanDisk one? I tried doing it by making an image with WinImage and then restoring it on the SanDisk, but for some reason it given me some error (error 27 the drive cannot find the sector requested) at 99%. The card is OK, because I managed to create a new CM bootable version on from scratch, but I don’t want to go through installing applications and configuration them all over again. If someone can help me with this, please do, I’ll be very grateful! I rebooted the NC and after the CyanogenMod7 logo screen, it brought up a prompt titled ‘Complete Action Using” and it wants me to select either com.android.provision.DefaultActivity or Setup Wizard. Also, I the touch interface is not responding whether I chose one or the other, so how would I select the correct option? i did all that was said to do and my nook still boots the origanle softwear. what am i doing wrong all the files appeare to be where they should be. I followed your instructions and everything worked smoothly–unlike when I tried to create the bootable card with Windows–The only problem was the boot partition was too small to copy both the update file and the GAPPS file, so I only put the update on. 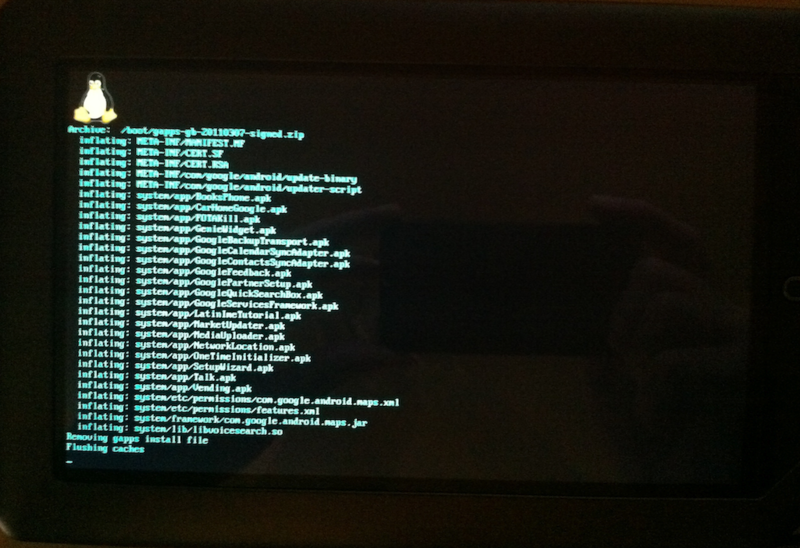 So, now that I have my Nook up and running on Cyanogenmod7, how do I install Google Apps? Okay, solved my own problem. I had the wrong GAPPS file and it was too large at 52mb. I downloaded the correct 6.2 mb file and everything’s fine. Using a Samsung 16GB class 2 micro SD card with good results so far. I had the card laying around, so I decided to give it a shot. Thanks again for your easy to follow instructions. WinImage wouldn’t work correctly for some reason. Used Win32DiskImager and everything worked out fine. THIS IS AWESOME!!!!!!!! THANK YOU, THANK YOU, THANK YOU!!!! Hello! Thanks for a great tutorial, but I am having problems burning the SD card with Lion. This is what I’m seeing in terminal. Any suggestions would be much appreciated! I’m no expert, but it looks as if your Trisha$ dd… ect. line is wrong. The file should be stored in your home directory, subfolder cs7 (the one you’re supposed to create). Then you use the first listed command line to tell it that folder is where to look. From there, you enter the dd line, only you put ONLY the name of the file (touchnooker.img). The terminal will already know to look in that sub-directory. Now, if im wrong on anything, I welcome correction, but this is what I did and it worked for me. Good luck! Worked flawlessly on my sister’s nook. Doesn’t work on mine or my friend’s. I get all the way through the linux screens, then power up the nook after shutdown, and it powers up into the nook OS, mounting the sd card like a normal sd card. I’ve tried on a Mac and on Windows. On my sister’s nook, I had to use Win32DiskImager to install. All 3 nooks are running the most current version (1.4.2?) of the nook system software. i purchased a nook with gingerbread flashed to the eMMC. yesterday, i flashed 4.0 ics to the nook via sdcard. long story short, it got stuck in the boot loop, reinstalled and rebooted to find my nook would only boot into clockwork recovery. since i couldnt find another answer, i started deleting things and unmounting (in CWR) and my nook shut off and wouldnt turn on. after a little searching, i relized i had formatted the boot file. so, i followed your instructions and the initial boot went flawlessly until the end of the Linux screen…now, stuck in the same thing! nook is still not responsive to attempts of powering on!!! what can i do? I have done everything according to the tutorial, but after the install is complete and it shuts down, the nook boots to original nook os. what have I done wrong? i tried two other methods to dual boot my wife’s NC with no luck…your mix did the trick! thank you. “All steps complete, flushing cache again. Then it shuts down. When I restart the nook with the Micro sd card, the same process happens, leading to the device shutting down. I can remove the Micro sd card and still have regular nook functionality. Is there something I did wrong? I reformatted the card and ran through the tutorial again to double check myself, but I got the same results. If there is any help you can give me, I would really appreciate it. i need help. The setup never shows up, instead it goes straight to the homescreen, but the touchscreen doesn’t work. I can still change the volume, lock it, and put it in landscape. I have to hold the ‘n’ key and the power key to turn it off. Could somebody point me in the right direction? 1) Instruction 7/7a. I could NOT get EaseUS Partition Master Home Edition to see my SD card using my Win 7 Pro, 64bit on HP Laptop. Tried 2 Sandisk cards. Used XP Home on an OLD desktop, and it WORKED. 150Meg Partition. 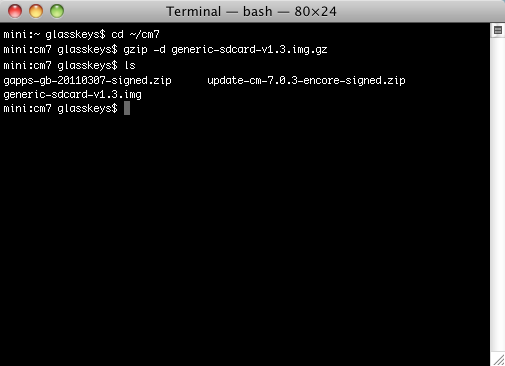 2) Actually used “update-cm-7.2.0-RC3-encore-signed.zip”. It WORKED great. Working great so far (~24hours). Faster than v7.0.3 as part of original instructions. Will work up to try CM9 soon. Thank You all for the great work. I did everything you said, but found WinImage hard to decipher. I did find a “how to” on their site, followed the directions, followed the rest of your instructions and got NOTHING! What could I have done wrong? anamardoll.com’s instructional videos helped and I got it to work, only my NOOK is very slow and not dual bootable. How can I make it dual bootable and run faster. Videos just won’t run! I finally figured it out! I had to divide the Cm7 installation and the google apps into two separate steps but I have made a fast running 8 gig n2a card for 12 bucks! it was worth the time and effort. Thanks Stephen for bringing all of this together. Too bad we can’t sticky the splitting the installation comment to the top that would have saved me a little frustration! I don’t think you can install CM9 using this method. The zip file is too large. After entering this, I get access denied. What is happening here? Keep trying to do this on a 16gb drive and it wont let me copy and paste the two files because it says the drive is full.